Angie Orth and I were recently interviewed by First Coast Magazine for their July bucket list issue. The interview focused on our love of travel and why it is an important component of our life. Grab the issue at your local Northeast Florida bookstore! You can also read the interview here. There are many things I could tell you about my trip to Vietnam. The chaotic border control. The pho in Hanoi. The beauty of Halong Bay. The colorful streets of Hoi An. The chaotic dance of the scooters. The importance of the Mekong delta. But I am going to start by focusing on the people who accompanied me and how they turned a vacation into a memorable moment of my life. Cambodia and Vietnam are neighbors. I started hearing about Vietnam as soon as I moved to Cambodia. My local friends, colleagues and neighbors would voluntarily disclose how awful the Vietnamese people were and how they changed Cambodia' glorious trajectory and stole all the limelight for themselves instead of sharing it with the region. I listened with skepticism but knew that some of the differences between these beautiful countries were deep rooted and dated back to Pol Pot and Cambodia's real demise. A lot of my friends made the trip to Ho Chi Minh pretty regularly because it was only six hours from Phnom Penh. I assumed I would make a weekend trip pretty early into my six-month stint but my trip to Vietnam ended up taking place during my last month in Asia. Parts of me wanted to go straight home from Vietnam, parts of me wanted Vietnam to be the start of a month of travel in Asia before I said goodbye to the enchanting continent. But things end up working out exactly as they should. My best friend and serial travel partner decided to visit me during my last month in Asia. He and I started our exploration of the world together and have stories that will bind us forever. We planned 10 days of travel in Vietnam and it felt like another one of our adventures all over again. Meanwhile, my cousin, Saima, and her husband, Arzi, also decided to join me in Vietnam before I moved back home. She and I coincidentally always meet in a new country. So far we have explored England, India, Singapore and Vietnam together. I last saw her in Singapore over Chinese New Year. We met somewhat serendipitously when my mom told me I had a cousin in London while I was I was studying in Birmingham. Of course I didn’t give it any thought until Saima reached out and we started emailing. Turns out she was really cool! Emails turned into weekend hangouts until they moved. She has become the big sister I never knew I had. How lucky was I? I got to explore a new country with the people I love while also being able to close out a memorable chapter of my life with them. Our trip was broken into three parts, the north, the center and the south. We ended up visiting Hanoi, Halong Bay, Hue, Hoi An, the Mekong Delta and Ho Chi Minh. Hanoi is located in the north and is the current capital. We spent the first day walking and getting acclimated to the neighborhoods. Walking is so therapeutic. It allows you to feel like you are part of the pulse of the city. You are amongst locals and foreigners alike. You get to experience the rich and the poor, the young and the old. You really get to see a place. Through walking, we discovered a coffee shop hidden behind a tourist shop. Once we got to the roof, our view was the city and Hoan Kiem Lake. It was the perfect way to meet the city and its inhabitants. Hanoi is the gateway to Halong Bay. Most tourists start here if they want to visit the bay. It does have plenty to offer aside from shuttle rides to Hai Phong. 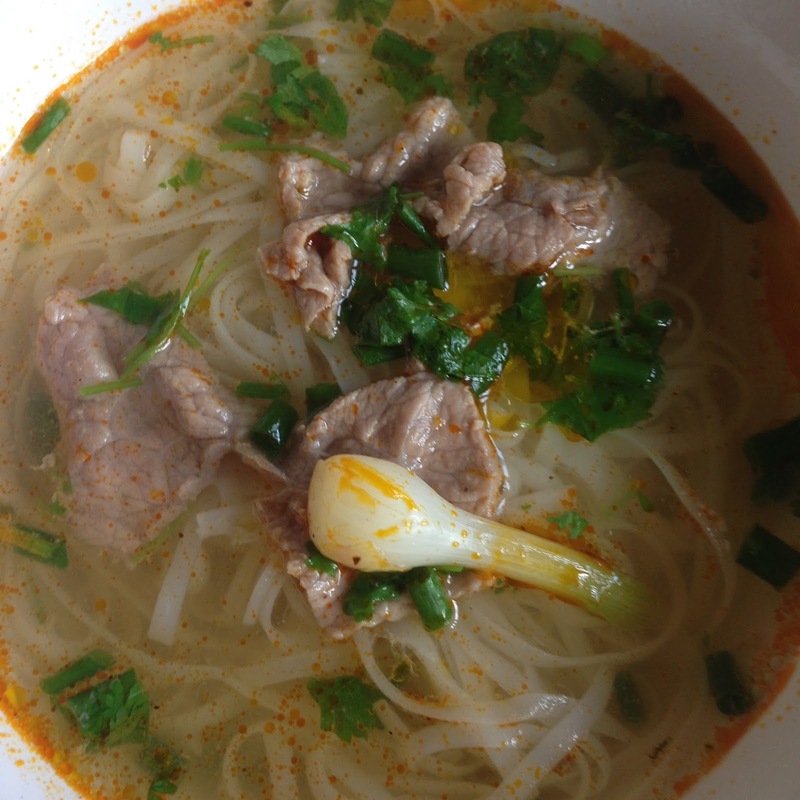 There is fantastic pho, the best you will ever have. I think I had one for every meal one day because I could not get enough. The Vietnamese also eat pho pretty much at every meal. One of our favorite moments was eating pho for breakfast with the locals. We knew we found a legit place when we saw businessmen in suits sitting on milk crates in the street in the summer heat. Ho Chi Minh also lays here in a creepy mausoleum. I say creepy not because you are going to look at a dead body. Creepy because of the rules you have to follow. You have to walk in pairs, you are not allowed to smile, you have to cover your shoulders and your knees. We discovered these rules the hard way. 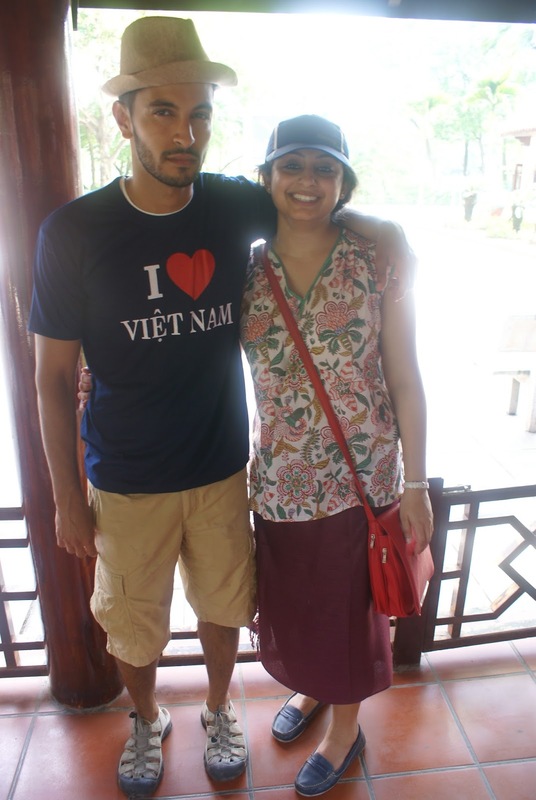 Z and Saima were wearing tank tops and had to buy cheap cotton I love Vietnam tees in order to enter. These were also over priced. I had to leave my camera behind with bag check. Nobody was friendly and it was a very robotic experience. Having said all the negative, seeing Ho Chi Minh lay there with his black nails is a sight I will never forget. This visit really reminded us that we were in fact visiting a communist country and need to follow all of its laws. All the tourist attractions, the French architecture and influence can’t detract from the fact that everything is very much controlled by the government. Our next stop was Halong Bay. The four-hour ride to Hai Phong was filled with cheesy pit stops where you are supposed to buy all things Vietnamese. The best part about this ride was seeing a laborer clean a marble statue with a toothbrush. As for the bay, I had arranged for us to spend the night on a secluded island call Cat Ba island. It looked beautiful in all of the pictures. I had no idea we would have such an eventful journey in order to reach it. It took us two speed boats, and a yacht to get there. Had I known that, I probably would have planned to stay for two nights rather than one. It was in fact an absolutely stunning place in the middle of nowhere. Literally. No stores. No local residents aside from the hotel staff. Nothing but eight shacks on an island. They fed us and had kayaks for us. Halong bay was also a beautiful sight. I have never seen anything like it. It is filled with thousands of towering limestone islands topped by rain forests. There are plenty of underwater caves for snorkeling and lots of opportunities for swimming and kayaking. Ironically, I learned that the boat tours are called “Junk Boat Tours." Most of the boats definitely aren’t junk boats and I wonder if the name got lost in translation. We said goodbye to Saima and Arzi here and Z and I headed to Hoi An, a shopper’s paradise. Hoi An was magical. There are bright colors all around you, in the lanterns, on the streets, on the doors, and of course in the shops. You will fall in love with the iconic silk lanterns that set an ambient glow outside everything, especially when you see them in the river. Our objective here was to consume as many Banh Mi sandwiches as we could from a local unassuming sandwich shop. They charge a local price and a foreigner price and I am proud to say that we received the local price on our fourth and final day. These things are indescribable and each bite was a taste of heaven. The other important aspect of Hoi An is tailoring. Custom tailoring for everything! Shoes, bags, suits, dresses, you name it. We got a little crazy and ordered seven suits, two shoes, two shirts, and one dress. Everything required daily check-ins but in the end the final products were worth it. Having had the extra time, we took advantage of Hue's proximity and arranged a private tour of the city. 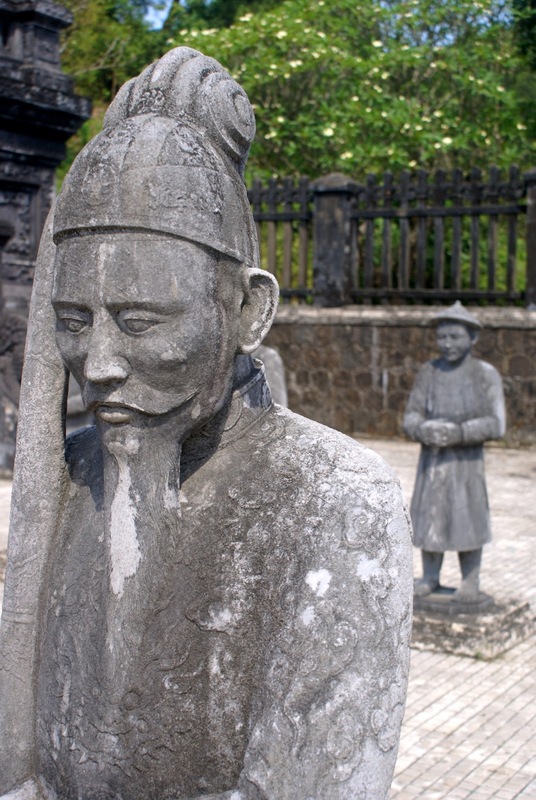 Hue is Vietnam's old imperial capital and is only two hours from Hoi An. It has the standard sights like the imperial city and many temples but we loved our excursion because of the Tomb of Khai Dinh. The tomb overlooks a hill and requires you to climb 127 steps before you reach the top. The statues on the first level were the best part for me. Yes, the mausoleum is intricate but the soldiers evoke a certain emotion and I wanted to spend time with each and every one. We also took time out for some r&r at the beach. We rented bicycles for the day and explored all of old town and then made our way to the sea . It was wonderful because the beach was filled with locals rather than tourists. It was a fun way to see their daily routine and we got a beautiful sunset as an added bonus. Stay Tuned for part II on Ho Chi Minh, the Mekong Delta and the Border. Born in Karachi, Pakistan. Raised in Fresh Meadows, NY. Refined in Birmingham, UK. Humbled in Phnom Penh, Cambodia. Home and heart are in Jacksonville, FL. Citizen of the world continuously seeking out new forms of adventure.